Baan Sirin. 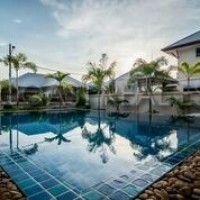 This Village is located in East Pattaya right next to highway 7 and has an easy access to town as well. This is a two storey house with 3 bedrooms and 3 bathrooms built on 52wah² (208m²) land. The house has private parking and a small garden. The living room, dining room and kitchen are all separate. The house is partially furnished and is fully air conditioned.